There are precious few positive things associated with a northern European winter, especially for a self-confessed Odo-nutter [a.k.a. dragonfly enthusiast] such as myself. Given the right conditions, a few dragonflies can occasionally persist into December but largely, by mid-November, their season is over. Most butterflies are also but a distant memory. The only respite for my interest set is provided by the birds. In winter, not only are our resident species more readily attracted to feeders in the garden but the country gets invaded by a number of winter migrants in search of a better food supply than is available in their summer breeding ranges. 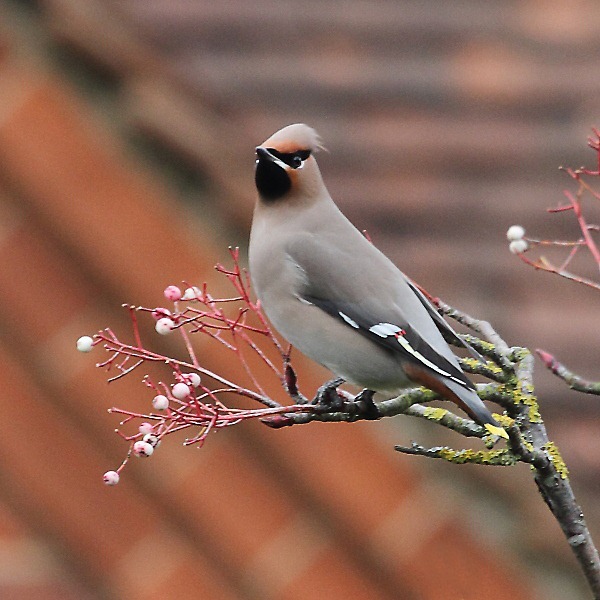 One such is the Waxwing, or Bohemian Waxwing (Bombycilla garrulus). 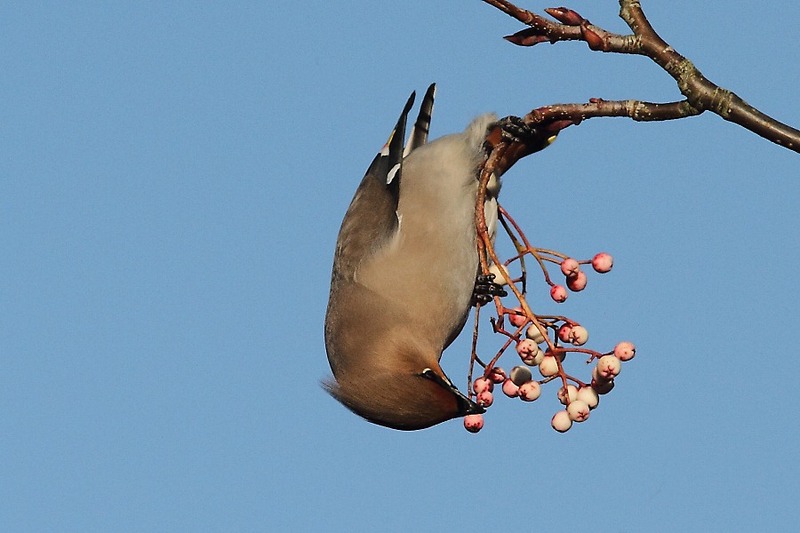 I saw my first ever Waxwing in Woburn two years ago. On December 2nd, 2010, I was on the operating table in hospital having my prostate ripped out. 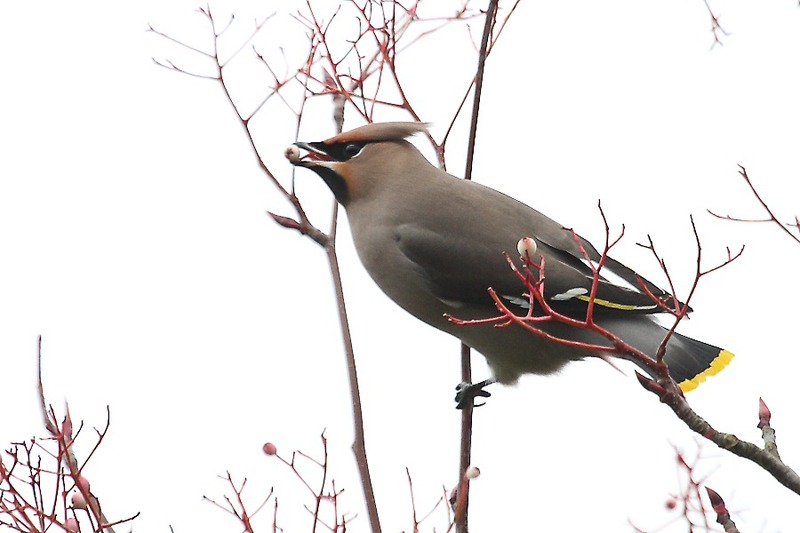 On December 12th, 2010, I was chasing Waxwings around the streets of Woburn, camera and monopod in hand. Attempting to tear about with a monopod-mounted camera, desperately trying to ignore the discomfort of the temporary catheter rattling against my thigh and … well, enough said … was quite a memorable experience. So, happily, were the Waxwings. These striking birds, about the size of a Starling, may be as common as muck in Scandinavia but their vivid plumage provides us with quite a winter spectacle when they flock across the North Sea to feast on our winter berries. 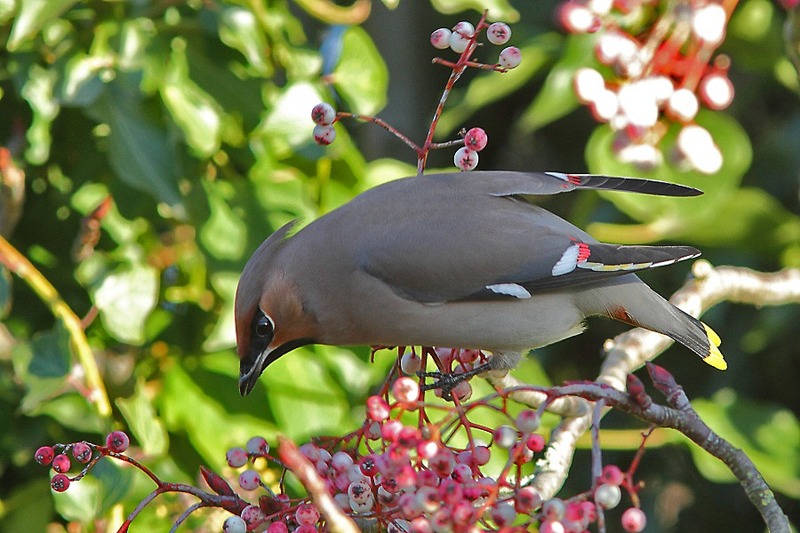 Woburn seems to be a regular Waxwing hot-spot. One of its roads is lined with Sorbus trees offering a ready supply of white berries, which the Waxwings seem to find irresistible. This weekend the ornithological jungle drums sounded again to announce their return so off I prepared to set for a reprise. Mercifully, this visit would be without the added excitement of a catheter causing discomfort. Much more relaxing! Saturday was cold and overcast. However, whereas the sun makes the Waxwings’ colours shine, it also makes for some awkward lighting conditions so I thought I’d give the overcast conditions a try anyway. Once in roughly the right area, finding the Waxwings is a doddle; all you have to do is look for a collection of very large lenses attached to cameras and, frequently, tripods. Follow the lenses and you’ve found the Waxwings. Or, at least, you’ve probably found one of their feeding stations. They operate in a flock. At periodic intervals, from a resting/digesting perch, a gang of them takes to the air to descend upon a Sorbus tree and raid a few berries each before a metaphorical bell sounds announcing the end of round 3. There is then a coordinated flocking back to their resting perch to be refreshed. After about an hour trying to follow the action my trigger finger was numb and I could no longer feel what I was doing so I retired. Sunday was sunny and cold. I returned for another try and found even more large lenses arrayed against our foreign invaders. I needed the lens clues because the Waxwings had moved about 100m further down the road. 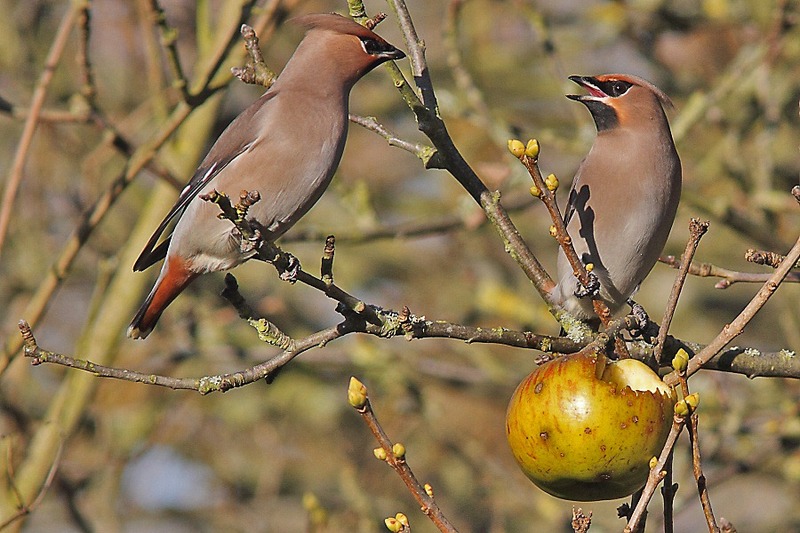 Waxwings have no sense of occasion and do not pose well, frequently placing themselves between you and the sun. On many occasions I found myself thinking a shot wasn’t worth bothering with while being surrounded by the machine gun rattle of belt-fed shutters going off. The advantageously lit side of the road was not exactly rich in Sorbus trees. However, in one back yard, an apple tree was attracting the Waxwings’ attention. The very accommodating owner invited a few of us lens-toting enthusiasts in to take advantage. What a nice man! I didn’t know Waxwings also fed on apples until today. A Fieldfare (Turdus pilaris) turned up – now I do know they like apples – but received short shrift from the gang of Waxwings, regrettably. Actually, some of the Waxwings were receiving short shrift from the Waxwings, too. Still, I suppose if you’ve flown across the North Sea to find some food, you’re damn well going to protect it.